This entry was posted in Awards, Worldcon and tagged Hugo Awards, Jameson Quinn, Kevin Standlee by Mike Glyer. Bookmark the permalink. I think you are mistaken but I don’t want to disrupt the discussion further with what maybe inadvertent concern trolling on my part. Well, I think “concern trolling” would more properly apply to the position I have, than the one you are taking (and concern trolling is certainly not my intention). But I appreciate very much that your disagreement is cordial and respectful. I don’t think it had anything to do with BT’s Puppiness, since in 2012 the SP campaign didn’t exist yet. Mostly I think the voting pattern was because BT had a strong core of supporters who liked his imitation Niven stories, but that his base wasn’t very broad. SP1 was in 2013, SP2 was in 2014, and SP3 was in 2015. I don’t think it had anything to do with BT’s Puppiness, since in 2012 the SP campaign didn’t exist yet. @Bill: Ah, I see. Maybe. I know the Pups as a group seem to have trouble understanding IRV (or at least they have professed trouble understanding it). Given BT’s cluelessness about so many other issues, I would not be surprised if he actually didn’t understand IRV and felt “screwed” by the 2012 outcome. I don’t think he’s brought that up as a grievance though. @Camestros Felapton: […] But the main thing is that panels can shut down griefing quicker than passing things on to members. Anything with a second stage means the griefers can draw out the hate for longer or leave somebody who is the target of the hate via some nominated work in the unenviable position of having fandom vote on whether the work attacking them attacks them enough to be thrown out. We’re dealing with people with a demonstrated history of running mass harassment campaigns against political opponents, sure. Many people in the community have been attacked in well-documented ways. A panel would be a lightning rod for that sort of behavior, and anyone on it a direct target. It would also attract anyone else with a grievance– We are not a monolithic community. There are trade offs with either system: 3SV is vulnerable to mechanical exploits, MSMC to social. I’d rather have the former than the latter. I believe that a “good cop” panel would be less of a lightning rod. Especially if it took unanimity to declare a work innocent without a vote. @Camestros Felapton: A little late to edit, but I wanted to add that mucking with 3SV in the described fashion is a sort of social exploit. I would be more concerned about it without No Award. Actually, now that I think of it, I’m curious to see how the use of No Award in 2015 compares to 3SV’s threshold for rejecting a work. Are the percentages close? That might be because there was a very low quality of the Graphic Novels last year. Both me and my brother was discussing that ordinary Hugo voters couldn’t read that much comics. Look at the Eisner awards instead. So much better stuff. I understand that you think that changes (even EPH) will give the slates more power, not less, but I can’t figure out why you think so. I didn’t say “slates” have more power. Take 2016. Under EPH, if many non-rabids nominated both Seveneves and Ancillary Mercy, rabid support for Seveneves weakens Ancillary Mercy. If lots of people nominated Penric’s Demon and Slow Bullets as well as Binti, it weakens Binti. It seems most likely to me that under EPH, rabids will tend to nominate more things which have broad support, even support among fans who also vote for those pesky “SJWs”. EPH can help them reduce the number of “SJW” finalists and boost some things those fans are reluctant to no award and interested to vote for. EPH + helps more, setting the stage for the kingmaker gambit. If that’s correct, and you want to maximize your chance of determining the final winner, you had better not waste nominations on trolling the SJWs with stuff they find highly offensive. 3SV lets you do both. You need just enough votes for the provocative nominees so that one or two reach the bottom of the long list. The rest of your votes can be used constructively and when the provocative items lose it strengthens your picks. Should you feel like getting tricky, choose 15 items, with #1 and 2 the things you most want to see win and 2 through 5 things you like and also have lots of awards buzz even among SJWs. 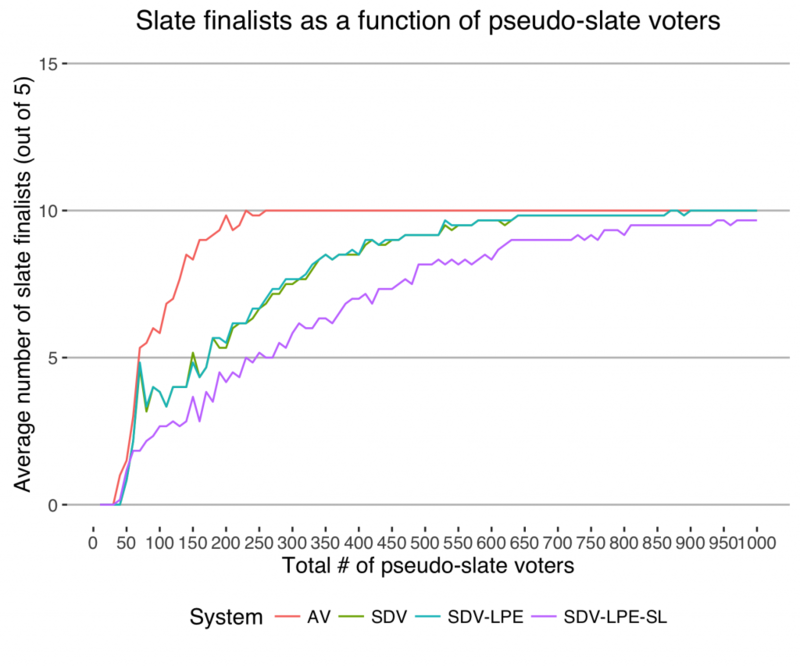 Generate unique ballots. In the first slot, randomly place #1 or #2. In the second slot, randomly place 3 through 5. In the remaining slots, if the ballot includes 1, generate a random combination of items 6 through 10. If 2, 11 through 15. Discard duplicates and send one ballot to each minion (for ideas and inspiration only). Then publish your recs in random order and urge right thinking people everywhere to join you in fighting the Orwellian new SJW Hugo contest. As the number of nominators grew, fan artist was no awarded by 12% in 2012, 13% in 2013, 11% in 2014, and 13% in 2015. Graphic story by 8%, 7%, 4%, and 18%. You might be right to some limited extent, but no awarding a minor fan category that many feel has outlived its usefulness is quite unlike no awarding a major fiction category. More argle bargle. There seems to be an unlimited supply of that. @Hampus Eckerman More argle bargle. There seems to be an unlimited supply of that. He likes to hear the sound of his fingers typing. Option 1: do nothing and have a shortlist determined entirely by a small group of trolls. Option 2: make some changes and not have a shortlist determined entirely by a small group of trolls. Brian seems heavily invested in Option 1. Or, to promote a #1 and #2 that have little support outside your bloc, and still place a couple items on the long list, you could list that #1 and #2 along with a #3 to 5 which have enough buzz that you predict they may already be on say 5% of the ballots. List four more including a couple trolling items if you want. Send out ballots including 1 or 2 plus combinations of 1-5 (that don’t duplicate items) and combinations of 6-9. Or, write a blog post recommending nine things and encourage fans to pick what they like, really. Or just campaign for some popular nominees plus a couple less widely acclaimed ones. The Rabid Puppies had a disciplined slate, all of whom voted for all the items on the slate in all categories. I ignored the Sad Puppies entirely. There were commenters on the recommendation blog posts disagreeing with some picks, naming things they liked better, etc. I don’t see how that assumption is justified. And why ignore Sad Puppies? Probably voted for a good number of things on the rabid rec list. Jameson:My curiosity sent me looking around the net for proofs on apportionment systems to get a feel for what an EPH/EPH+ proof would look like–lots of interesting things out there. Horst F. Niemeyer and Alice C. Niemeyer contained some proofs that seemed like they could be used as pieces if rearranged. Just curious, did you think about how some form of largest remainder method could apply here? I don’t recall if that got brought up last year. Thanks. 1. Yes, that’s pretty much the kind of logic I’m imagining for proving things about EPH+. 2. 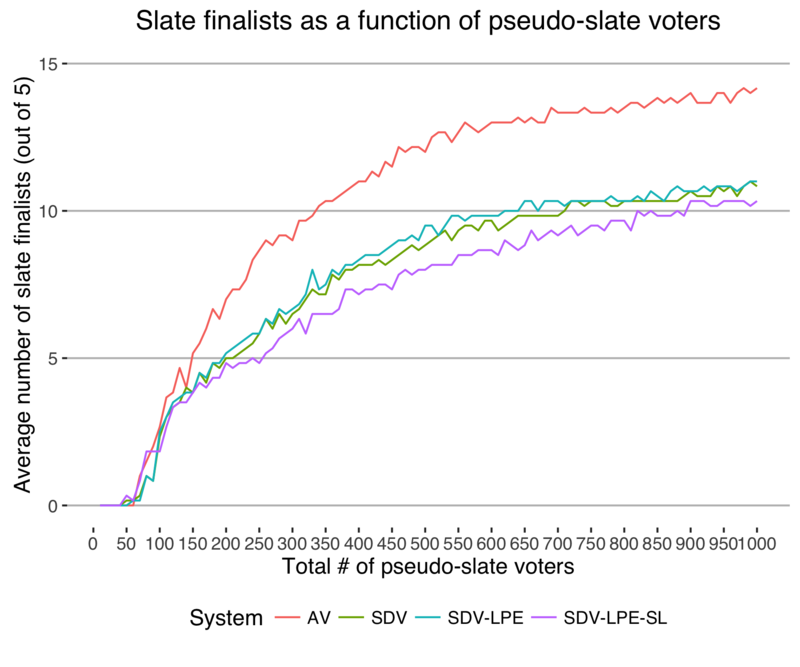 Largest remainder systems start by supposing each party has an inexhaustible store of functionally identical candidates; not a great assumption for the Hugos. 3. The closest thing that might work are reweighted approval systems. We considered those, but they are really unintuitive, and leave a strong bullet voting incentive. Thanks Jameson. Both those make sense now that I think about them. Looking at apportionment methodologies opens up an interesting corner of history I hadn’t payed attention to prior to this. I’m working on a new post on this. Comments welcome. Mike: look good so far? When I was helping to put together the proposal for EPH last year, there was one thing that struck me above all else: Fandom is very, very diverse. We don’t agree on much. We have very different tastes. And we all feel very strongly about our opinions. As I said in the business meeting, that’s a strength, not a weakness. It is, however, something we need to recognize, and it has direct application to the proposals being discussed here. My main concern is with the idea of having any panel or jury decide if a work is a troll or not. Simply put, one small subsection of fandom serving on a jury will never be able to make that determination for fandom as a whole. Consider the My Little Pony nomination this year. My first response when I saw that was “Really? Really? This is supposed to be a serious award!” I have small children. I’ve watched My Little Pony. It is definitely not my cup of tea. I personally don’t think it qualifies as fantasy. But then I learned that there is actually a fairly sizable population of adult fans who love the show. Fans who think it’s one of the better fantasy shows on television. Is My Little Pony a troll nomination? Because it’s been put forth by Beale, probably. But ask yourself, if it hadn’t appeared on his list, would we still consider it a troll? I don’t know. Heck, we can’t even agree on the definition of science fiction. Is Outlander science fiction? You could make a case for it. But what if the jury members simply don’t like a heavy romance component to their science fiction? How do you decide if something is serious science fiction or fantasy? More fundamentally, how do you decide if something is offensive and not just provocative? I was deeply offended by some of the works that made the finals this year. But if there is one thing that SFF has taught me, it’s that there’s no universal definition of right and wrong — and as much as it pains me to admit it, my views aren’t universal, either. One of the great strengths of SFF is that it allows us to explore those grey areas in a thought-provoking way. There’s just no chance of a small group of people being able to make that determination with any hope of reliability or validity. It has nothing to do with “I don’t want admins having that much power.” It is simply that it’s not possible to represent all of fandom with just a small subset. For this reason, I have to be strongly opposed to any kind of panel empowered to remove works from the Hugo nominations. I’ve spent over a year of my life thinking about and working on this problem. We may think it’s the only easy, foolproof way to deal with a social and human problem. As much as I wish it were, it’s neither. As for the other two proposal types (DN and 3SV), like many of you, I find the idea of a negative vote to be distasteful. Not in the spirit of the Hugos and SFF. But in thinking about the “review board” idea I discussed above, it occurs to me that 3SV is a review board. It has all of the advantages of the review board but solves the review board’s greatest problem: A small group of people can never represent the diversity of fandom — but fandom at large, by definition, can. Essentially, that’s what 3SV is: All of fandom is empowered to serve on the review board and decide just what is and is not science fiction and fantasy. And, again, by definition, they will always be correct. As Kevin has said many times, that’s how democracy works. As others have noted, EPH was not developed to deal with the problem of blatant trolls. We specifically did not want to exclude anyone. It was developed to deal with honest fans who have banded together to use dishonest tactics. I never felt the Sad Puppies should be entirely excluded, and I still don’t feel that they should today. They love SFF. They are part of fandom. Their techniques are wrong, and that needed to be addressed. The problem of the Rabid Puppies is that they have no interest in being fans. They simply want to destroy. EPH is absolutely necessary no matter what proposal we end up adopting here. But proposals like DN or any similar “semi-final round” suffer from the same philosophical weakness as EPH: It is still no defense against trolls who want to burn down the Hugos. Does it help? Maybe. But there’s no chance it will be enough, for all the reasons that have been discussed here. So, in the end, I’ve changed my mind from my initial thoughts about these proposals. I think 3SV+EPH is the only real way to deal with both the problems of unfair slating and destructive trolls. I think those are the only proposals I can support in good conscience. Thanks for your comments, Kilo. I’ve edited the FAQ in the draft to respond to them better. I would like to see results from the second round for the original top 5 and any that replaced them on the final ballot. I could see not showing the rest since they wouldn’t have changed the result. It would be similar to seeing exactly how many votes for No Award came in above other works. I’m finished with the first draft of the FAQ in my post-in-progress. Thanks to everyone who’s sent me comments. My main concern is with the idea of having any panel or jury decide if a work is a troll or not. Simply put, one small subsection of fandom serving on a jury will never be able to make that determination for fandom as a whole. Consider the My Little Pony nomination this year. My first response when I saw that was “Really? Really? This is supposed to be a serious award!” I have small children. I’ve watched My Little Pony. It is definitely not my cup of tea. I personally don’t think it qualifies as fantasy. But then I learned that there is actually a fairly sizable population of adult fans who love the show. Fans who think it’s one of the better fantasy shows on television. Is My Little Pony a troll nomination? That is a fair point but I think it casts the net widely so as to make the task seem more arbitrary and in danger of false-positives. What I’ve suggested for a panel is a restricted remit but with broad powers within that remit – specifically the power to remove works intended to harass or defame people and/or works designed to disrupt the actual mechanics of voting (e.g. works with spoof names to make admin’s and voter’s lives harder. We’ve already seen how this year’s griefing tactics have worked to make getting the Hugo Packet out just that bit harder and a bit more tiresome – while also leading people down a garden path of discussing quite which bit of a harassing work is sufficiently harassing. So, yes I agree that I wouldn’t want a jury or a panel to rule on MLP or even Space Raptor BI, but there are two other works nominated by the Rabids this year, parts of which include personal attacks on individuals. I find the idea of putting that out to members and saying (effectively) ‘vote on whether you think this was nasty enough not to be a finalist’ worrisome as it would be a means for griefers to further harass or demean a target. In terms of slates, I think the +2 proposal (adding additional works in the event of shenanigans) is simple and positive and leaves the final decision in the hands of voters. That plus EPH and No Award makes slates as a way of dominating the ballot, useless. However none of those stop the kind of shitstirring attacks that the ALtRight are more than capable of and have past-form on – i.e. where they simply want to make things nastier and don’t care about winning. @Keith “Kilo” Watt: Is My Little Pony a troll nomination? It was trolls stacked on one another’s shoulders. If Beale were to appear in Equestria, he’d be a villain. Off to Tartarus with the rubbery goblin. @Keith “Kilo” Watt: Is My Little Pony a troll nomination? Because it’s been put forth by Beale, probably. But ask yourself, if it hadn’t appeared on his list, would we still consider it a troll? I don’t know. Heck, we can’t even agree on the definition of science fiction. I wouldn’t. It’s not the episode I would have chosen, but that confirms your point. My draft for a new post is more-or-less done, though unpolished; but due to unforeseen circumstances I will not be posting it for the foreseeable future. Any comments are still welcome; we’ll see how this goes. 1. Provoke you into doing things they think would discredit you. 2. See fewer undesirable finalists. 3. See more finalists they consider great and pick the winner. With EPH, they can do either 1, or else 2 and 3, but it is harder to do all of them. With EPH plus DN, they can do either 1, or else 2 and 3, but it is harder to do all of them. With EPH plus 3SV, they’ll do all of them. But ask yourself, if it hadn’t appeared on his list, would we still consider it a troll? Exactly. They can read the rules and are already promoting edge cases. The problem of the Rabid Puppies is that they have no interest in being fans. As I see it, the work of a admin board would not be to decide if a work was serious SFF or not. Their work would be to tell if the only reason the work was on the ballot was because it had been slated on by block voting. That is the one thing that only administrators might know and not the membership as a whole. Also the admin board can look at works that are used to harass or defame living persons. So the reasons for an admin board are not those you mention. What it comes down to for me is this: I want to have my own input, and I want to know what the rest of the Hugo voters have to say. For example, last year there were calls to put Laura Mixon under No Award. She was a finalist for Best Fan Writer largely because of her blog post about Requires Hate which was included in the Voters Packet. Some felt that it was harassment and defamation of a living person. Some felt that she was on the ballot unfairly due to promotion by GRRM. Obviously, the voters as a whole disagreed and gave her the Hugo. I’m glad it was up to the voters — even if it had gone the other way. What would a panel have done?